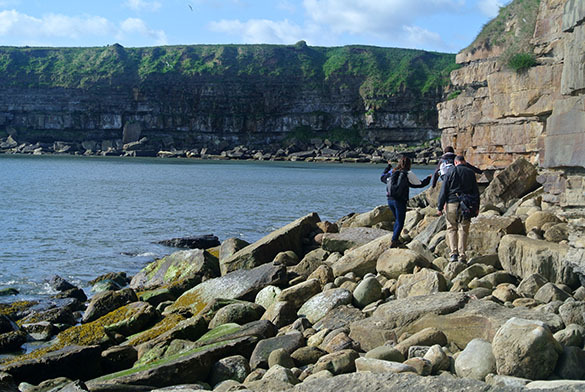 SCARBOROUGH, ENGLAND (June 6, 2015) — Today Team Yorkshire got an early start this morning examining the Jurassic sections along the coast north of Scarborough. With Paul Taylor as our skilled English driver, we took the rental vehicle first to the village of Cloughton and then towards the coast for a hike to Hundale Point (above; N 54.33877°, W 00.42339°). There we exploring this beautiful section of the Scarborough Formation (Middle Jurassic, Bajocian) exposed as a cliff and wave-cut platform. The day did not start easy. Our first attempt to get to the Point involved a long scramble over boulders at the bottom of the seacliffs. This is not my favorite kind of hiking as every step involves a decision about the stability and slipperiness of the next boulder. Note the slimy green algae on some surfaces. This was, though, a good introduction to various sedimentary features in the nonmarine portions of the Middle Jurassic section here. These rocks are important because they host petroleum under the North Sea. Here we found one member of the Scarborough, the Spindle Thorn Limestone, to have lots of shelly fossils, including bivalves, gastropods, brachiopods, serpulids, belemnites and crinoids. They are relatively easy to extract from the matrix. Below the Spindle Thorn Limestone Member is the Hundale Sandstone Member. 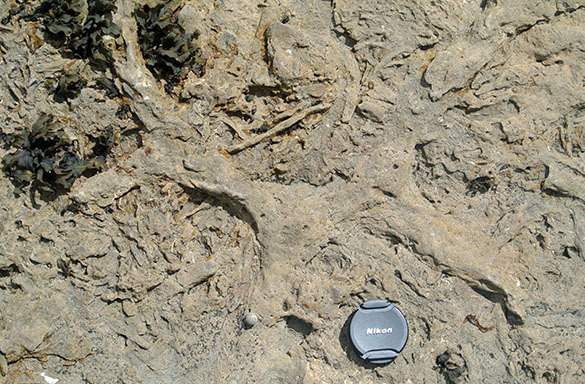 It has a fantastic suite of trace fossils exposed on the surface of the wave-cut platform. Here we see Thalassinoides (the large branching trace) and Planolites (unbranching smaller cylinders). A great thing about working on a rocky seacoast is that a living hard substrate fauna is easily visible. 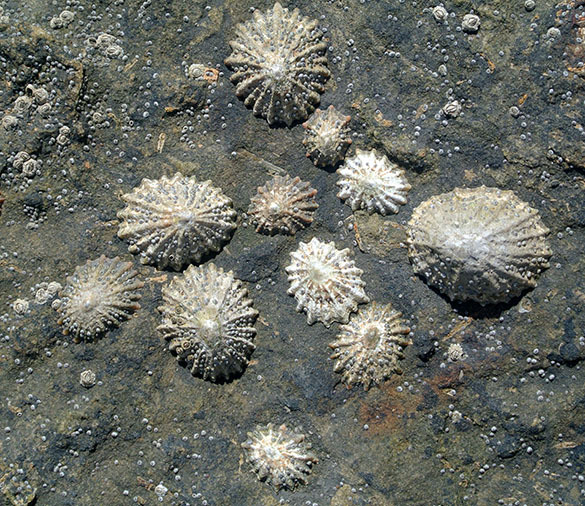 Here’s a fun set of limpets and tiny barnacles at Hundale Point. Our lunch stop was at Robin Hood’s Bay (N 54.41782°, W 00.52501°), which we accessed by way of Stoupe Beck. 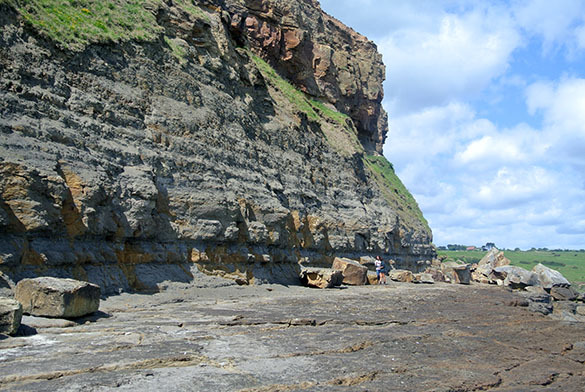 We briefly explored the Redcar Mudstone Formation (Lower Jurassic, Hettangian) on a rocky platform at low tide. Near the cliff we saw some trace fossils and a few lonely shelly fossils. 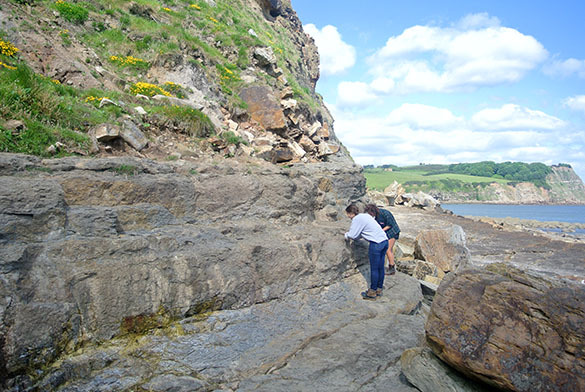 We ended our geological explorations of the day at Whitby, where we again examined a rocky wave-cut platform. 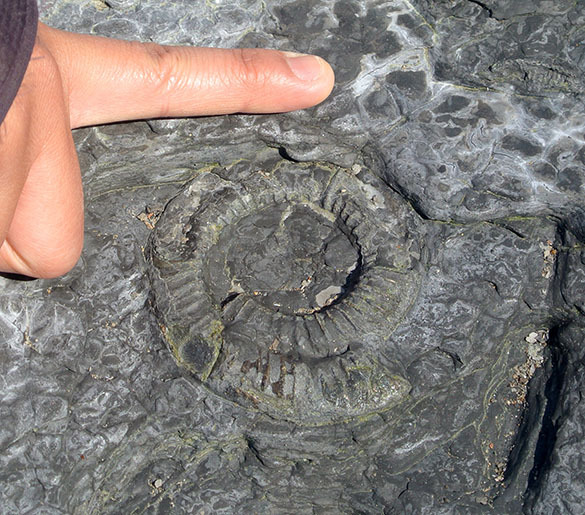 We found numerous ammonites (like the one above), belemnites, and nuculid bivalves in the Whitby Mudstone Formation (Lower Jurassic, Toarcian). After our work on this very, very windy day, we headed into Whitby for ice creams and a look around the sites. 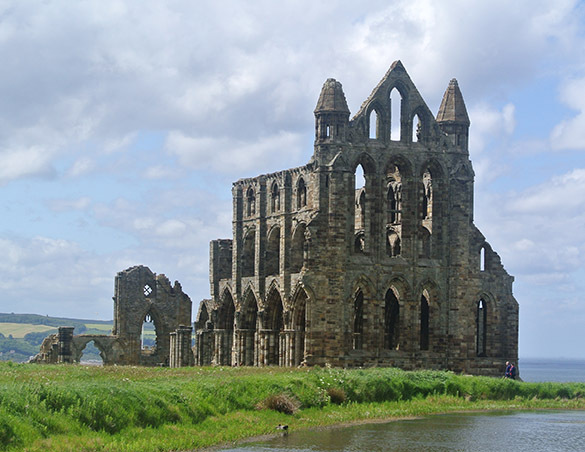 The ruins of the Whitby Abbey are iconic for the region. They are high on a hill overlooking the city and the sea. This has been a set of ruins since the time of Henry VIII. 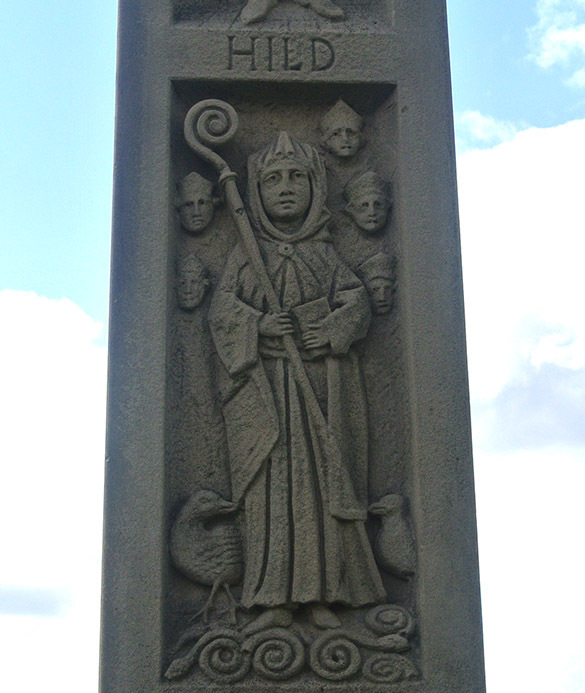 Paul took us to a monument to local saints, including Saint Hilda (614-680), shown above. She was said to have turned the region’s snakes to stone, which you can see above at her feet. Those snakes better look very familiar to you! 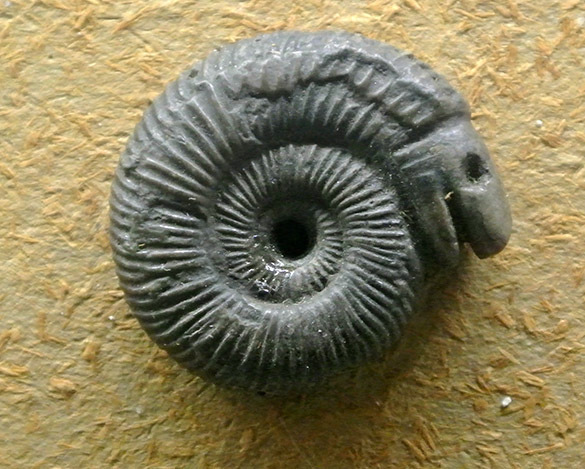 To enhance the ammonites-as-petrified-snakes legend, 19th Century craftsmen often carved snake heads onto ammonites. This specimen is in the Whitby Museum. We learned a lot today. Paul even got to see a section new to him, the one at Hundale Point. Mae and Meredith have seen some project possibilities. Tomorrow we visit sections south of Scarborough. Note from our photos that we had sunny skies. The winds, though, were fierce!